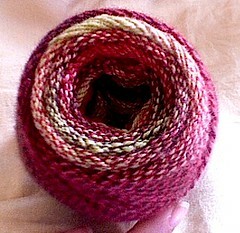 Craftster Community > FIBER ARTS > Spinning: Completed Projects (Moderator: PerfectlyBohemian) > Sock yarn, yay! 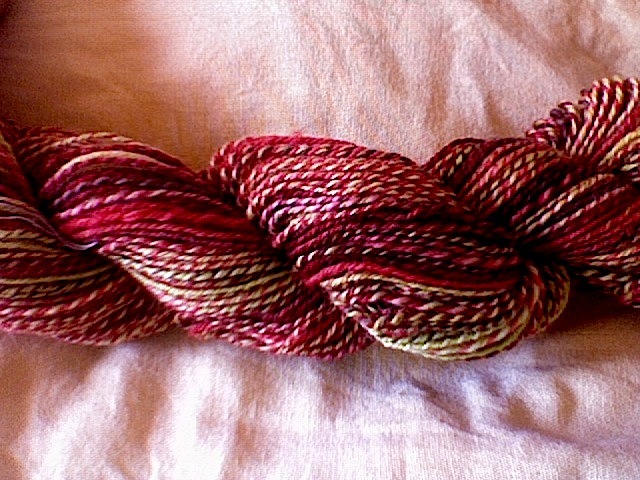 I got back to spinning after several months, with a new spindle, and I just made my first usable yarn! Finally something that is soft and (mostly even) and on the thickness I was aiming at! This is absolutely gorgeous! And it boggles my mind to think that it was done on a spindle! I can't achieve such evenness on my wheel, much less a spindle! Beautiful!! They will make wonderful socks! MommyLeek, when I use the park & draft with a spindle, I get more consistant singles than I do most of the time using a supported long drawl on my wheels. I never spun on a wheel, but I found that my singles aren't all that even, and doing a 3-ply helped a lot with making the differences less noticeable than they would be with a 2-ply. I also noticed that I got more even lenghts of yarn from drafting continuously with the spindle moving than I'd get with extreme pre-drafting. It was definitely a thing about memory on my fingers. The best parts of the singles were spun while I was paying less attention, spinning in front of the computer while reading an e-book. Every time I'd forget to pay attention and the spindle hit the floor, I'd look to the piece of yarn just spun and it was all at the same thickness. I got a new pic of the center pull ball. I'm so happy, I just have to show. I love the colors and can't wait to see the finish products. Socks are my favorite.